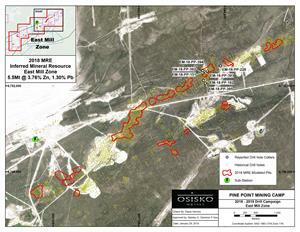 MONTREAL, Jan. 30, 2019 (GLOBE NEWSWIRE) -- Osisko Metals Incorporated (the “Company” or “Osisko Metals”) (TSX-V: OM; FRANKFURT: OB51) is pleased to announce assay results from the latest 7 drill holes completed in the East Mill Zone (“EMZ”) within the Pine Point Mining Camp (“PPMC”). Drill hole EM-18-PP-151 intersected 8.07% Zinc and 6.80% Lead over 12.74 metres within the modeled K-32 pit boundaries. Drill hole EM-18-PP-392 intersected 10.90% Zinc and 4.28% Lead over 6.00 metres at the west edge of the modeled K-32 pit boundary, and hole EM-18-PP-182 intersected 11.78% Zinc and 6.01% Lead over 4.35 metres in an area 130 metres to the south of the currently modeled pit boundary, near historical Cominco drilling. (See 2018-2019 Drill Campaign: East Mill Zone - K-32 pit). The pit number refers to modeled resources pits included in the recently filed NI43-101 Technical Report filed on SEDAR.